US-based Blue Label Digital Printing has integrated its Cern management information system (MIS) with Esko Automation Engine production system, in a bid to effectively manage its operations. The integration will allow Blue Label to complete job works in two phases. Under the first phase, the preparation of one-up artwork will be carried out manually, while the creation and approval of the proof files and sending ganged step and repeat files will be done automatically by Automation Engine. As part of the second phase, operators will keep the files in a Cerm folder, which will be processed in Automation Engine for proofing. Later, they will be forwarded to the press. Automation Engine makes the files to be RIPped for the press, while Cerm MIS collects and tracks the status of every job across each production stage, including details from the press. Blue Label Digital president Andrew Boyd said: “We are an all-digital label and packaging printer that specializes in short to medium run high quality labels. “We offer the best commercial quality labels with unmatched service, whether the product is to be sold in a farmer’s market or for a large brand on the shelf. We scale to our customers’ needs. Based in Lancaster of Ohio, Blue Label Digital Printing provides custom label manufacturing solutions for beer, wine, specialty foods, spirits, health and beauty, juice and other sectors. 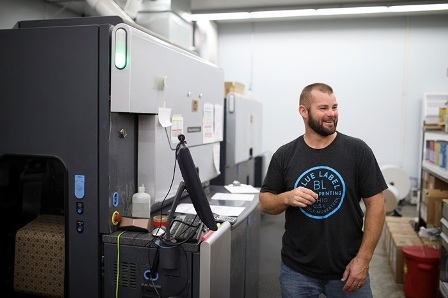 With around 50 employees, the company uses HP Indigo digital presses to run small and large batches, which take around three to five-business day turn around time. Image: Blue Label has incorporated Cern MIS with Esko Automation Engine production system for better operations. Photo: courtesy of Esko-Graphics bvba.